China's College Grads Face A New Reality: Fewer Jobs : Parallels Young Chinese are graduating in record numbers, but the country's once-red-hot economy has cooled. 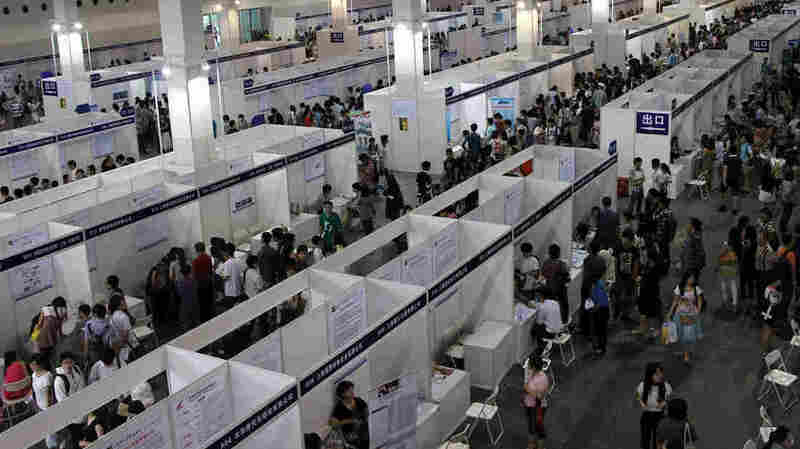 And critics say because many young Chinese have known only booming growth and have higher expectations than earlier generations, they don't show much commitment to looking for work — echoing a complaint about millennials in the U.S.
Thousands descended on a job fair in Shanghai earlier this year. This summer nearly 7 million people graduated from Chinese colleges, but jobs are harder to find than in previous years. It's been about two months since college graduation, and more than 3 million graduates from this year and last still don't have jobs, according to government officials. That's not in the U.S., but in China. China is home to the world's fastest-growing major economy. But with nearly 7 million college graduates this year, a record number, finding work is tough and a worry for the ruling Communist Party. Earlier this summer, thousands of new grads poured into an exhibition center in Shanghai for a job fair. Dressed casually in sports shirts and simple trousers, they moved from booth to booth, snapping pictures of job postings with their smartphones. "It's severe, the market still is not booming," says Nie Blanca, who studied international maritime law at Binzhou University in Shandong, a coastal province north of Shanghai. Nie, 24, was looking for work with a shipping company, but the shipping booths here were empty. "Now the shipping market is depressed, very, very depressed," she says. "Many shipbuilders have gone bankrupt. They aren't recruiting many people." Weak economies in Europe and the U.S. have hurt trade with China, which is trying to shift its economic model away from cheap exports and real estate and toward consumer spending. In the spring, the country's gross domestic product growth slowed to 7.5 percent — a big drop from the heady, double-digit rates of the last decade. "Compared to previous years, there are not that many jobs for new graduates," says Tae Yeol Kim, an associate professor of Human Resources Management at China Europe International Business School in Shanghai. "This high unemployment ratio is not a sudden problem," Kim continues. "Gradually, every year, the job openings decrease because of the economic downturn, and the college graduates increase." China has boosted college enrollment to develop a more educated workforce, but all those higher-paying, management jobs have yet to materialize. Kim says universities need to train more students for the jobs that exist, which sometimes involve gritty work. 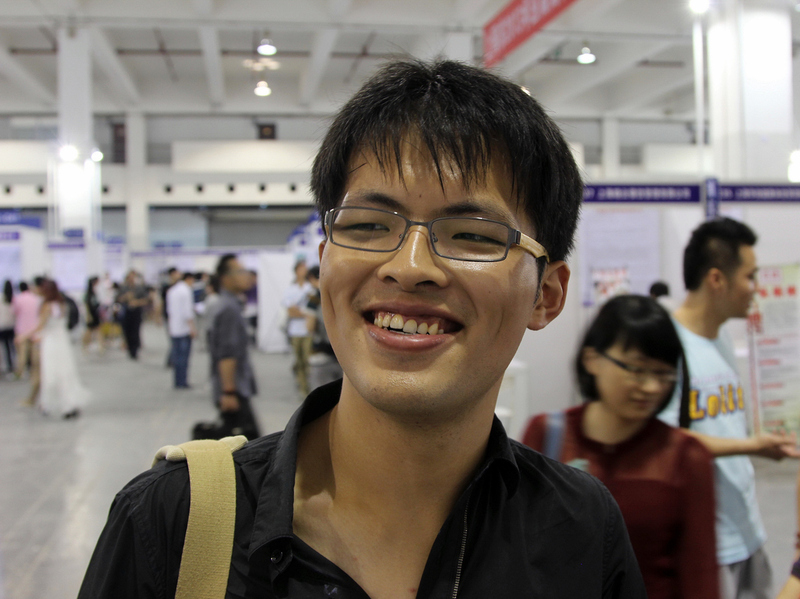 Hou Feng, who graduated from Shanghai Maritime University, has been offered a few such positions, but he's holding out for something more stimulating and prestigious. Hou Feng, who graduated from Shanghai Maritime University, has been offered some entry-level jobs, but he's holding out for something more prestigious. "Graduates have a lot of requirements," Hou says. "In the beginning, the jobs are pretty boring. If you're a salesperson, you have to make 100 phone calls a day." Hou, 23, studied logistics and has considered training programs, but prefers a desk job that requires minimal exertion. "In the first two to three years, you need to start from the bottom," he says of the training programs. "Some work as movers, some even work as drivers, going to ports to examine cargo." Jennifer Feng, who works at www.51job.com, the Monster.com of China, hears these complaints a lot. She says people born after 1990 — called "jiu ling hou," or literally, "after 90" in Chinese — have only known booming growth and have higher expectations than earlier generations. "If a job requires overtime or the office is relatively far from their home, their parents will tell them not to take it," says Feng. "The young generation wants to work for fun, not work for life." Echoing complaints about millennials in the U.S., Feng says many Chinese don't show much commitment in the application process. She recalls asking a young job candidate what his career goals were in the next three years. "He told me he would go abroad," she says. "I thought it was very strange. If you plan to leave the country after three years, why should I hire you?" Feng says back in the 1990s, Chinese outworked most foreigners here. But she says in recent years, Chinese have lost their edge. Facing tough labor markets at home, Taiwanese and people from Hong Kong have come here hungry and willing to work. Today, Feng says, "they work harder than mainland Chinese." All of this concerns the Communist Party, which bases its rule largely on the ability to deliver jobs and growth. On Sunday, Premier Li Keqiang met with students at Lanzhou University in western China's Gansu province and talked about the labor market. He urged students to start their own businesses and create jobs themselves — or move to western China where growth is higher but conditions are less attractive. The students responded with smiles and applause, but amid tough job numbers and slowing growth, it will take more than pep talks to help China's legions of new graduates find work.